Olive oil in a muffin? You may regard this suspiciously but the citrus zests and the almonds is the flavor you pick up more that the fruity oil taste. The oil give the muffins a delicate, moist texture. Preheat the oven 350’F. Place paper liners in a 12-cup muffin tin. In a medium bowl, stir together the flour, baking powder, and salt. Use an electric mixer to beat the granulated sugar, eggs, and zests in a large bowl until pale and fluffy, about 3 minutes. Beat in the vinegar and milk, then gradually beat in the oil. Add the flour mixture and stir with a spoon by hand just until blended. Crush the almonds with your hands as you add them to the batter and stir until mixed. Fill the muffin tin almost to the top of the paper liners. Bake until golden on the top and a toothpick tester comes out with moist crumbs attached, 20-25 minutes. Transfer to a wire rack and cool the muffins in the tin for 10 minutes, then turn the muffins out onto the rack and cool 5 more minutes. 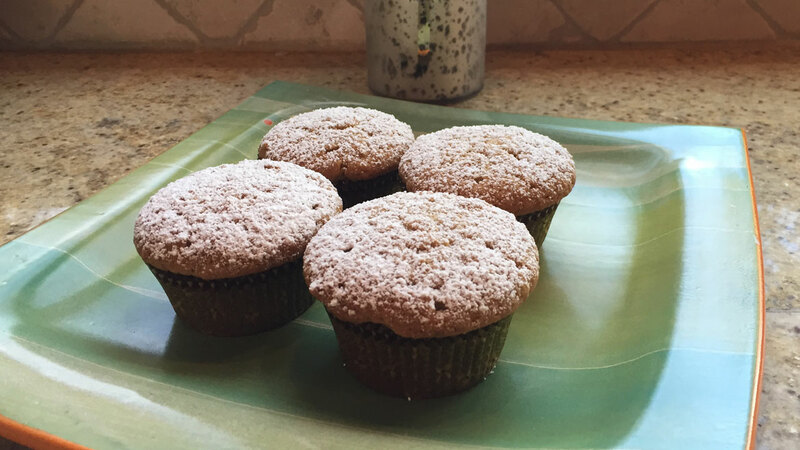 Sift confectioners’ sugar over the muffins and serve.